Terrarium kits make attractive gifts and terrarium kits crop up in many catalogs and shopping websites around the holidays. Some businesses make a tidy profit packaging a few easy-to-find supplies into a heavily marked-up terrarium kit. If you'd like to gift a terrarium kit this holiday season, consider putting together one yourself with a few simple materials. Use your imagination! 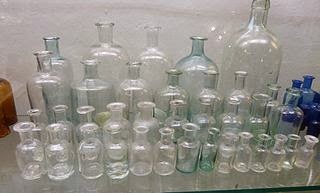 Use wine bottles, vases, tiny bottles, bowls, containers with lids- anything! Consider looking at a second-hand store rather than expensive vases or storage containers called terrariums. Mix two parts potting mix with one part sand to ensure proper drainage. Pebbles, small rocks or small pieces of glass can all be used for the rock layer in your terrarium. You can buy activated charcoal at any aquarium supply location. The spaghnum moss serves as a filter between your soil layers and charcoal, and is optional. See 19 terrarium plants suited to life under glass. Bamboo skewers to maneuver plants and soil. Be sure your trinkets or statuettes will fit in the terrarium vessel.